How do we dig our way out of this one? Treehugger posted a story saying that all is lost, using the sales stats of the Ford F series trucks as an argument…and am admittedly compelling one, as they sell one every 4.5 seconds! It just adds to a similar train of thought in my life lately though..how do we dig ourselves out of this pit we’ve created for ourselves…how do we transition to a sustainable society? The Global Footprint Network attempts to calculate the difference between how much natural resources we use, and how fast nature can replenish that. If you hadn’t figured it out already, that date falls on August 2nd this year, and has been getting worse every year (follow this link for more on that). We’re on a dead-end path here, robbing from future generations so we may live lives of luxury. The news of droughts in the West this year has surely escaped none living in the US…and with global warming forecast to increase severity of droughts, and population continuing to grow, we need to take a long, hard look at water usage in this country. The title of the video below, ‘The Drying of America: Too Many People, Too Little Water’ sums it up extremely well. So what can the average citizen do? Well, you can start with reducing household water consumption – replace lawns with xeriscaping and take shorter showers to begin with. That will be a great start…though water consumption of food production will need to be improved, as well as energy production. For example, powering a 60W incandescent lightbulb for a year requires 3,000-6,300 gallons of water (source). Things like fracking put additional strains on an already short water supply. So in summary…things are looking bleak, and you can expect this issue to only get worse in coming years. Don’t be an idiot and plant a new grass lawn! Until we learn to live more sustainable lifestyles, we’re going to be faced with more ‘peak stuff’, where demand for a particular resource exceeds supply. Fast Company has a nice article on this subject if you want to read more. One example is clean water. More people equals greater demand, but resources are diminishing as glaciers melt and some aquifers are depleted. Food is another one, though the system is so wasteful (in this country at least) that I’m optimistic we can make some big improvements there. Or at the least, stop burning food (turning corn into ethanol to power cars). The idea of Peak Oil, where demand exceeds supply, threatened us for a long time yet continual advances in oil extraction techniques keeps pushing that date farther and farther out, as explained in a recent article over at FastCompany (worth reading if you’re into this stuff!). Instead, we’re facing a new dilemma…we’ve gotten so good at extracting fossil fuels from the ground, that we now face the grim reality of the environmental impact of consuming the known and accessible fossil fuel reserves. If we want to stay below the internationally-agreed upon 2°C of global warming, we can dump about 565 gigatons more CO2 into the atmosphere. The problem is that current fossil fuel reserves, ignoring any future discoveries, contain about 2,795 gigatons of CO2 (source). Yeah. Not good. Either fossil fuels need to get so expensive that people stop using them, or we’re going to really mess up this planet. The BBC reports that globally, around 100 million sharks are being killed each year. This is a mind-boggling number and anyone who thinks we can deplete the numbers of an apex predator at that rate without consequences is a fool. I’m scared of what the future brings to our society when we are so blatantly altering the ecosystem that future generations will depend upon, without being able to really understand what these changes will actually mean. It’s stupid and selfish. With an increasing population tapping depleting aquifers, much of this country (and the world) is on an unsustainable path that is going to lead to water shortages at some point in our lifetimes. We will adapt, it’s what we’re good at, but we need to be aware of how water is being used in our lives to know what to change. I’ve seen a few topics in the news lately that might not be obvious water hogs. The first is fracking, for which the debate seems to focus on threats to our water supply, caused by leaking fracking fluids which threatens our groundwater supplies. While that’s being debated endlessly, there’s another water issue being overlooked. That is, the water that is used by the fracking process. According to Frack Free Colorado, each well requires 2-8 million gallons of water to create, and may require additional water over its lifetime if it needs to be re-fracked. Biofuel is talked about as one solution to our energy problems, providing both a local fuel source, and a lower carbon liquid fuel option. Well, notice that word, ‘liquid’? You guessed it, biofuel production uses large amounts of water. The world consumes about 32 billion barrels of oil per year…that’s about 1.34 trillion gallons. One gallon of biofuel takes about 3.25 gallons of water to produce…the math just doesn’t add up here. When water shortages occur, the priority will have to be water for people and crops…there just won’t be enough water left to use for fracking or biofuel production. Lastly, there’s the issue of groundwater pollution…which isn’t something most people really think about. However, check out the EPA’s How’s My Waterway website to get the scoop on water quality of streams and rivers near you. It’ll tell you about water tests for metals, pathogens, pesticides, etc. You might be surprised by what you find…I know I was! I’d often considered biofuel to be an interesting development, one that could hopefully replace fossil fuels, with no real downside (though not exactly carbon neutral). However, I came across an interesting article talking about how biofuels, at least as currently envisioned, require phosphorus for growth. 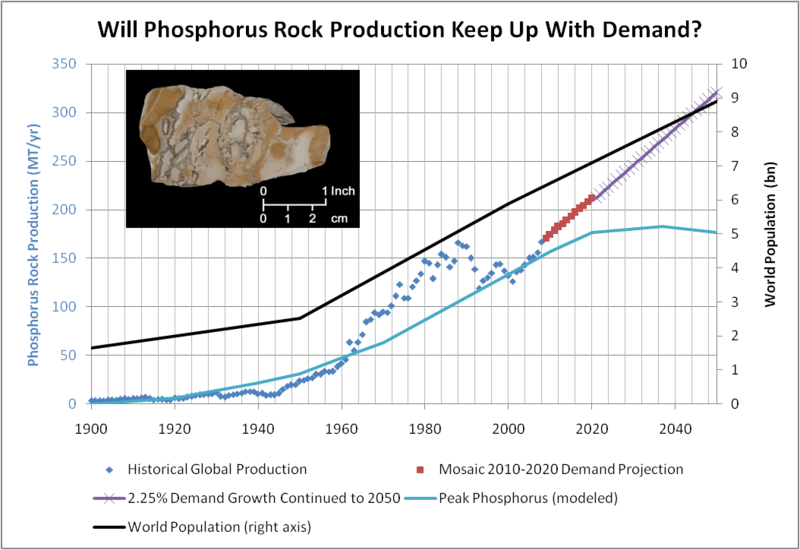 Meaning, we now face a ‘peak biofuel’ situation, or rather, ‘peak phosphorus’, where biofuel production capacity can be tied to limits on phosphorus production! Thus, while still worth pursuing, we need to be a bit more realistic in our expectations of how widely adopted biofuels can ever become. You can read the whole article here. The upside to peak plastic? Peak Plastic is the idea that the supply of plastic (which is limited by oil, for the most part) will be less than the demand…and in all likelihood, this will happen within our generation. I came across an interesting view on this at BoingBoing…that is, when plastic prices get high enough, there may be value in digging up the vast amounts of plastic buried in landfills and recycling that. Mining raw materials, in essence. Since plastic takes a very, very long time to decompose, it’s not as far-fetched as it may sound. There are still advanced engineering plastics that need to be made from raw materials (polycarbonate, ultem, etc), but for many consumer applications, recycled commodity plastics may be perfectly suitable. Not exactly news, but some more warning signs about depletion of underground water supplies in this article at Scientific American. The basic problem is that agricultural demands are depleting the aquifers and eventually we won’t be able to rely on them for food production. The good news is that around 80% of the world’s aquifers are being managed sustainably, but that 20% that’s not are critical to food production. Combine that with global warming and an increasing planetary population, and it seems we have a serious problem looming.